Note: Preserve Vision Florida recently acquired the Lenz Frenz® brand. The following reviews were posted by customers on the original Lenz Frenz® website. Ordered for Christmas gift for my granddaughter. Process to order was very easy and arrived fast. Was surprised when it arrived so soon. LOVE, LOVE, LOVE the bear. Cannot wait to give it to her. She is just five years old and always losing her glasses. Thanks for such an awesome invention and great quality. My granddaughter is having surgery tomorrow on her eyes and I bought her Teddy. She loves him and has named him “Bear Bear.” She has held onto him all day and loves showing everyone where the glasses go and is taking him to the hospital with her tomorrow. Thanks for helping make her hospital visit a little easier. Wish I could add a picture of her smiling face holding him. Saw this on Meredith. Ordered it because of a young nephew who is a glass wearer. However, I am ordering another one because this one never made it home from work. My patient load has dementia. They like to carry things like dolls and stuffed animals and they frequently lose their glasses. If the caregivers put away the glasses we know where they are and the patient forgets. 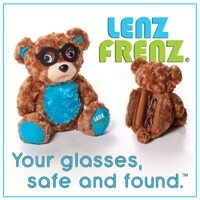 I am hoping our management will see the benefits of Lenz Frenz and consider ordering for our glasses-wearing patients/residents. His grandma bought this for him; he was feeling a little unhappy about having glasses and this made him feel special and it works very nice to send back and for to his Dad’s. My four-year-old granddaughter recently began wearing glasses. I sent her a pink bear which she took to show-and-tell at school. According to her mom, she loves the bear. Saw you on the Meredith Verio show. My friend’s son just got his first pair of glasses. Went to your website, picked out my order, and it was shipped within 48 hour. And he loved his bear binkie! Makes a great gift for Nieces and Nephews, Grandchildren or anyone who has or is getting glasses. I bought one for my daughter. I will definitely buy more as Gifts! Shipped quickly, received in a few days after order was placed! Good Quality! I just purchased one of these owls for my niece and I’m positive she will LOVE it! He is just so soft and cuddly, and the perfect size for snuggling at bedtime or while watching tv. She is always losing her glasses, so I’m hoping that this encourages to keep track of them a bit better. I must admit that I considered keeping it for myself, and getting another for her! It was a little slow getting here, but I think that’s just because of the time of year in which I ordered it (Black Friday). I highly recommend for children and big kids! Got this for my granddaughter and she loves it! Such a great idea! I was in the audience at the Meredith Viera show and we all got the small Bear contact lenz frenz. I thought it was adorable and ordered the Owl eyeglass Lenz Frenz for my 6-year-old Daughter, who just got her new glasses that same week. She loves keeping her glasses there and says her owl is so cute and soft and cuddly! She can’t wait to take him in the car when we drive to Florida for vacation. Her Owl sits on her night table and keeps her glasses safe! Best Idea… I am gonna order one for myself. We purchased the Big Owl as a gift for a six-year-old. She loves it! We were happy to see two ways to hold our 4-year-old’s eyeglasses. In a year or so, we anticipate that he will be able to put them on the monkey himself at night. I bought the puppy as a gift for my 4-year-old cousin who just got his first pair of glasses. He was absolutely thrilled and did not put his new best friend down the entire day. His Mom really liked the gift also, as he now has a safe place to store his glasses. The puppy is well made, extremely adorable, and very useful. This is a great product and I have already recommended it to several friends. Very cool! Great idea! Got it for my 7-year-old and she loves it; the stuffed animal is so soft and now she never has to wonder where her glasses are! Ordered this for my great niece. She LOVED it. She’s 2.5 and feels extra special with a puppy watching over her glasses. Thank you so much for making glasses fun for wee ones! How about a Kitty for when she’s loved puppy to the max? We bought our puppy Thomas to help our 4-year-old transition to wearing glasses. Best purchase ever! It’s well made and soft! We couldn’t be happier! Our 6-year-old son, was so upset when he found out he needed glasses. Big puppy has been so helpful with the transition. What a great idea!!! Thank you! I will highly recommend these little guys. I bought this for my 9-year-old granddaughter’s birthday. Well made. Soft and cuddly. Glasses will be safe at home or in travel (overnite PJ parties`or to grandma’s house). My daughter said: “Mom, you buy the neatest gifts.” Thanks to the Meridith Viera show!!! I saw them advertised/ discussed on the Meredith Viera Show …. I’m so glad I bought this product:-)! The quality of the materials used, and the stictching are high quality:-)! It’s a very well-made product:-D!!! I bought it for myself …. My children don’t wear glasses….. I LOVE IT!!!! I also wanted to support the child to whom this product was inspired by: & to all the children who have been affected by being bullied. Thank you for being so thoughtful in making such a wonderful product! My 6-year-old old son loves his dog stuffed animal. He was so excited when he opened up the box. He loves sleeping with it at night and wherever he goes so does his stuffed animal. I ordered it when I found out my 3-year-old needed glasses. He was so excited to see his new glasses inside the puppy. I love this idea; now he has a safe and consistent place to put his glasses in. When I got my Lenz Frenz out of the bag to see what I had bought for my granddaughter I could not believe how cute and so so soft the puppy was. I know my granddaughter will love this for Christmas. I had several of my co-workers fall in love with it too! I am glad that you were inspired for the idea of this product. Thinking of buying one for myself for my glasses. I was so impressed with how quickly it arrived and the great quality and workmanship. I am excited to give this as a gift to my daughter and think she will love it. I even want to get one for my own bed to safely tuck away my glasses at night. I tried my glasses in it and they fit great – I have no doubt that my daughter’s glasses will safely fit inside the case and I think this will help keep her from losing them. Good product that I highly recommend. What a great idea and awesome product! I had just learned my 4-year-old granddaughter was getting glasses when I read the article about Lenz Frenz in the local newspaper. It is perfect for children who need to learn to take care of their new glasses. Big Puppy is soft, sturdy and very well made. My granddaughter knows exactly where her glasses are when she wakes up in the morning! I also ordered the Big Unicorn for a Christmas present. A girl can’t have too many LenzFrenz! My 3-year-old granddaughter is having to wear glasses and this is teaching her responsibility while still being fun. Her glasses are safely tucked away at night and even her big sister is learning to help her remember. It’s a win-win. T-Rex was so soft and cuddly, did not expect that. Awesome compartment to keep glasses safe, thrilled with whole idea! Granddaughter was always falling asleep with her glasses on, resulting in glasses being out of alignment. Now she uses the Unicorn – no further problems. Great product. My 7-year-old loves it. It’s very soft and huggable. She takes it everywhere. The only thing is the tip of her glasses peek out of the case when closed but the flap closure protects it. All in all, very happy with it. I think this idea is great and the unicorn is adorable. I think the price is a little on the high side but it didn’t keep me from buying it because I support this idea and cause. I wish there was a smaller Version for glasses like the contact one. I haven’t given it to my granddaughter yet but I know she will love it. I like the idea of the coloring sheets that match too. Hopefully I will be able to order my other granddaughter one soon. My grandaughter at age 4, got her first pair of glasses. I thought this would be good to teach her to put them away safely in same place each night. She wouldn’t put it down when it first came. She loves it. So do we, the quality & concept are superb! Thanks for following through on your idea in good taste! I was incredibly touched when I heard the story on Detroit Fox 2 news! My niece is at the perfect age so I ordered that very night; it came faster than fast. My niece absolutely loves it and I almost wish my daughter wore glasses so she could have one too… but it makes my niece feel that much more special that she has something to call her own that no one else in our family has. Your story was touching in every way and I hope to buy more!